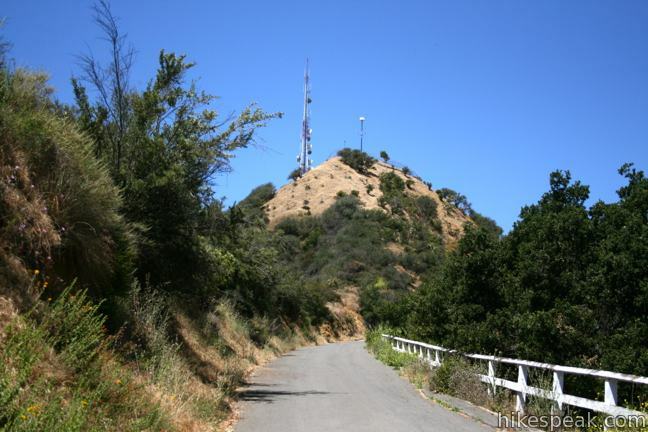 Hikers have several ways to reach the Hollywood Sign atop Mount Lee in Griffith Park. 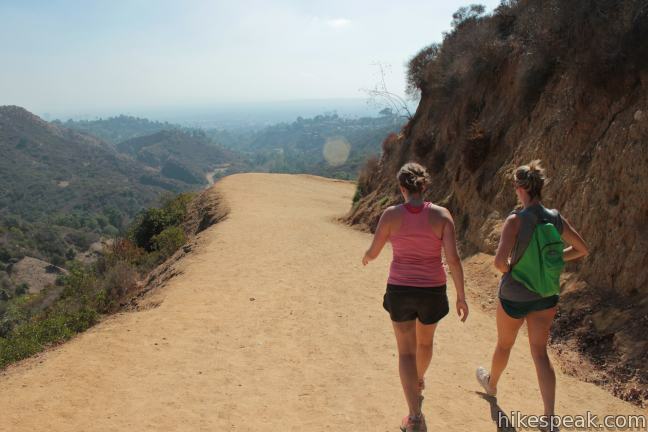 For a short steep hike, you could cross Cahuenga Peak for a tough 3-miler. 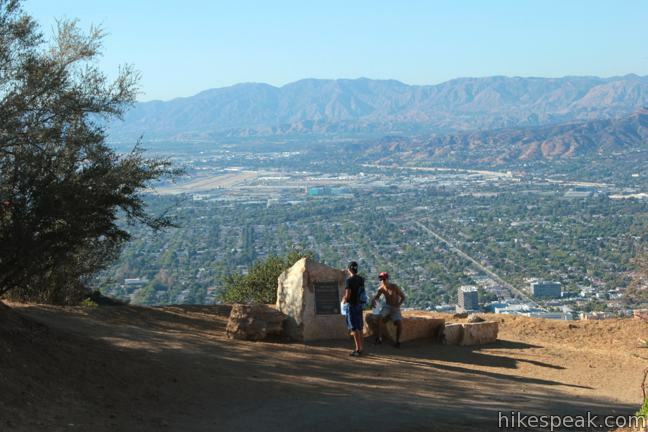 For a lengthier 6.4-mile trek, you could hike from Brush Canyon Trail to Mount Lee. 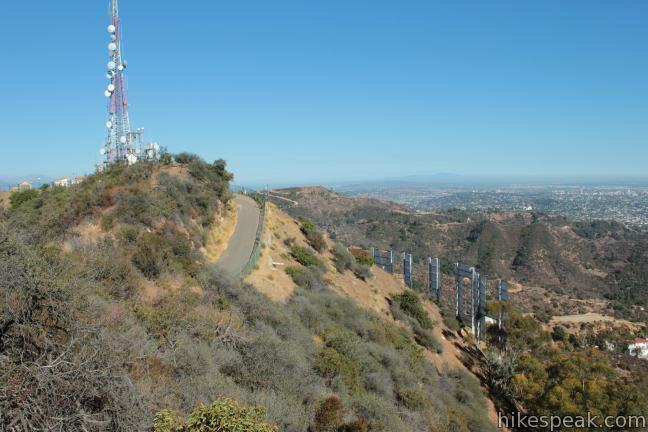 Hollyridge offers something in the middle, a 3.5-mile round trip hike that climbs 750 feet to the Hollywood Sign. 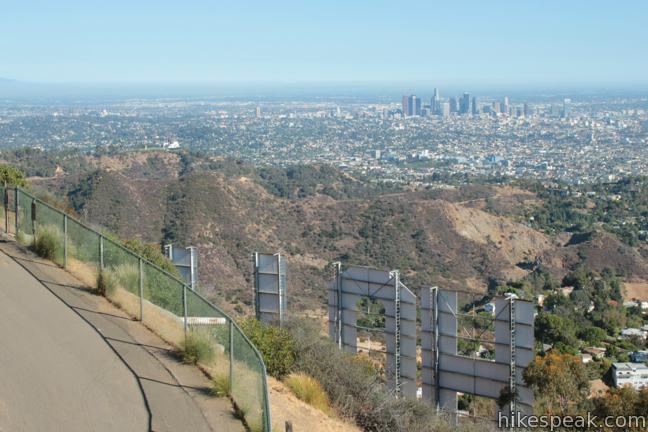 Accessing the trailhead is a challenge, but views of the Hollywood Sign come early. Bad News: The Hollyridge Trailhead was closed to the public in April of 2017. 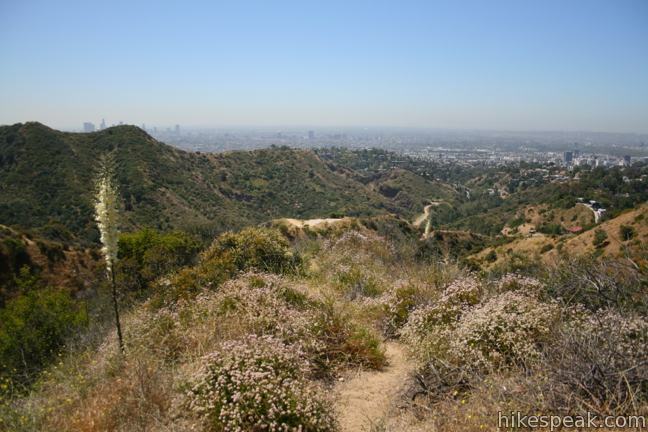 Brush Canyon Trail to Mount Lee is the suggested alternative to hike to the Hollywood Sign. The directions from Hollyridge Trail will remain on this site, should the trailhead be reopened. (Yes, it should!). The journey begins from a trailhead at the top of Beachwood Drive (just before the Sunset Ranch horse stables. Start up a wide dirt trail, which quickly comes to a T with Hollyridge Trail. Turn left and head north up the ridge. 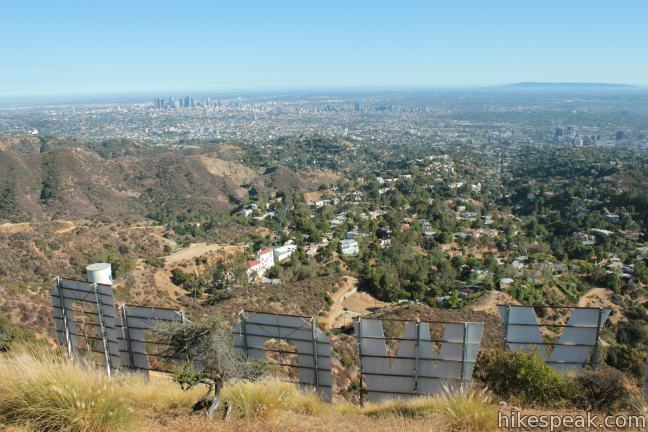 After a tenth of a mile on Hollyridge Trail, reach a viewpoint of the Hollywood Sign. 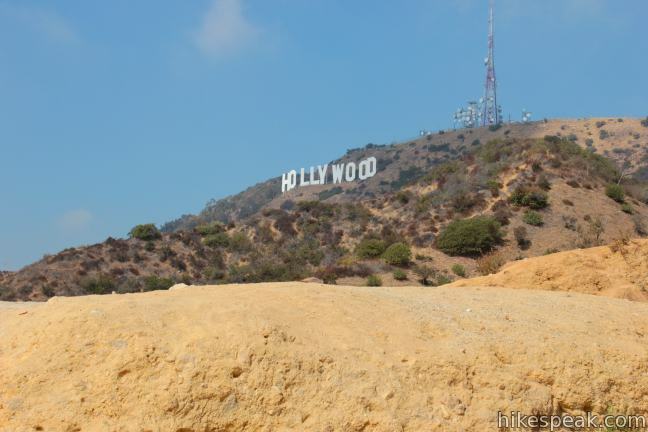 It is an angled view of the sign, but all nine letters are visible and this is one of the hike’s best perspectives of the Hollywood Sign. Just past the viewpoint, stay straight past a horse trail coming up from Sunset Ranch and continue another quarter mile up to a junction with Mulholland Fire Road. Make a sharp left turn (joining hikers coming up from Brush Canyon Trail) and proceed a quarter mile to a junction with Mount Lee Drive. 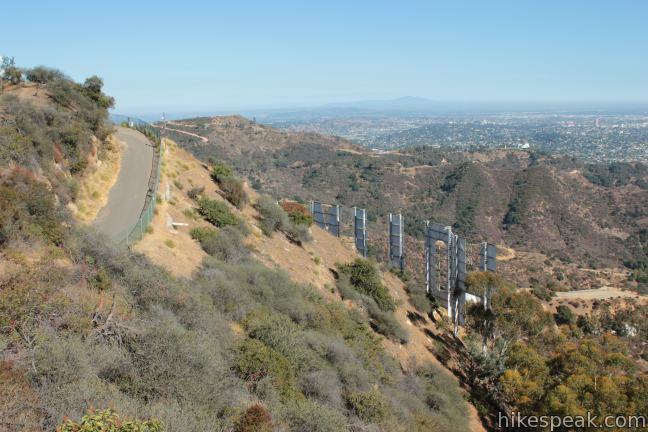 To the left, Mount Lee Drive descends 0.4 miles to a spur to Hollywood Sign View, which is more easily reached on the hike to the Hollywood Sign via Innsdale Drive, Mulholland Highway, and Mount Lee Drive. Turn right on Mount Lee Drive and follow the winding, paved road to the summit, gaining 450 feet in 0.95 miles. As you climb, look east for a nice view of the Griffith Observatory. 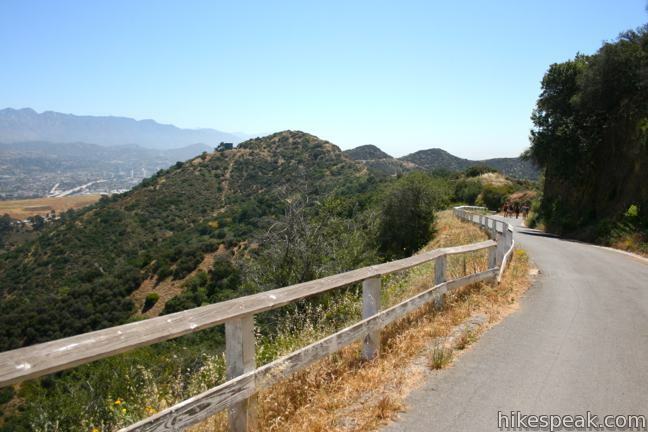 The road eventually ascends to the north side of the mountain for a view over Burbank, the Verdugo Mountains, and the San Gabriel Mountains. At the top of the mountain, the road makes a horseshoe bend to the left, passing a plaque and a junction with Aileen Getty Ridge Trail, which crosses a ridge to Cahuenga Peak. Around the bend in Mount Lee Drive, you will find yourself right on top of the H in Hollywood. 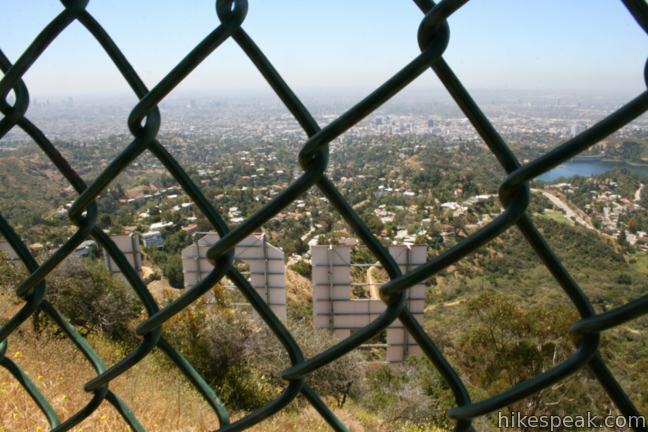 A tall chain-link fence keeps hikers from approaching the tall white letters and obscures the view. 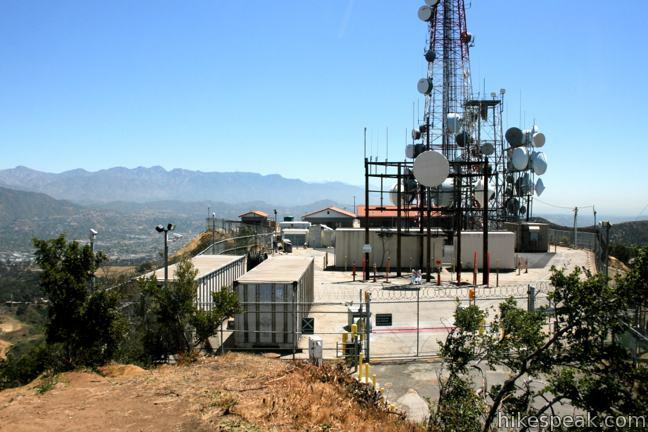 Walk up along the fence to a closed-off area full of radio towers and take the dirt path to the left up to the true summit, twenty feet above the road. 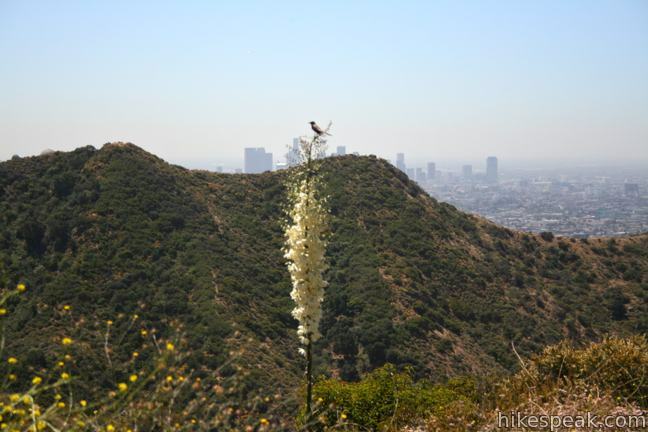 The 1,700-foot mountain offers sweeping views of the eastern peaks of the Santa Monica Mountains and the city below. Picture everywhere you can see the Hollywood Sign from and that’s what’s in sight. 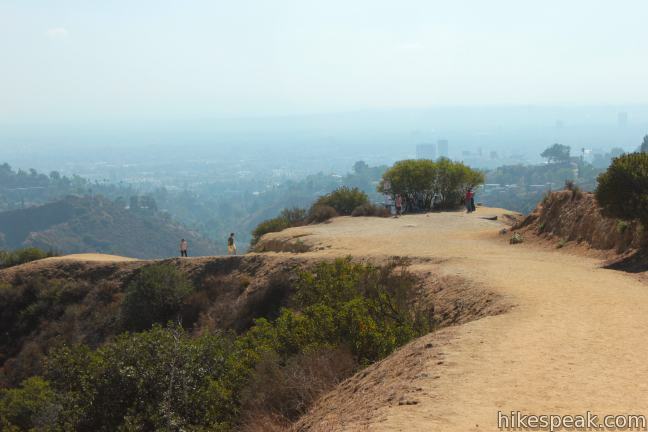 If you came this far and have the energy for a bit more, it is highly recommended that you extend the outing and hike over to Cahuenga Peak. Follow the narrow and rugged Aileen Getty Ridge Trail west over the ridge to the 1,820-foot summit. 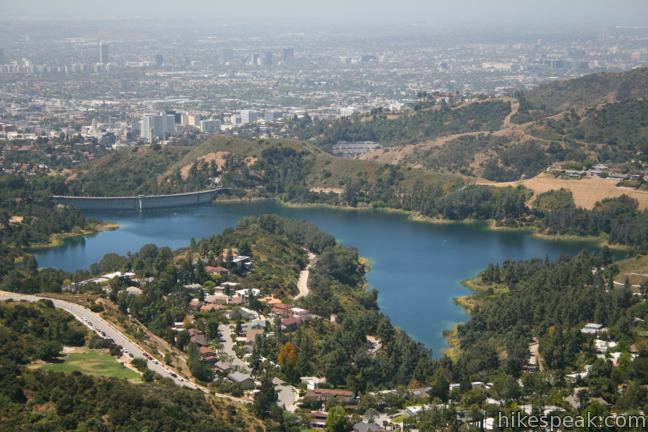 The terrain drops off steeply on both sides of the ridge, delivering dramatic views that include Lake Hollywood to the southwest. 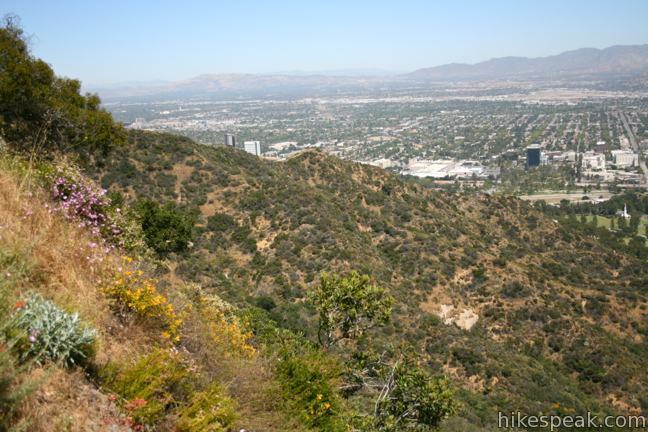 Follow Aileen Getty Ridge Trail for a third of a mile to Cahuenga Peak, which was spared from developed by citizens who blocked a housing project and contributed to the Save the Sign Campaign. 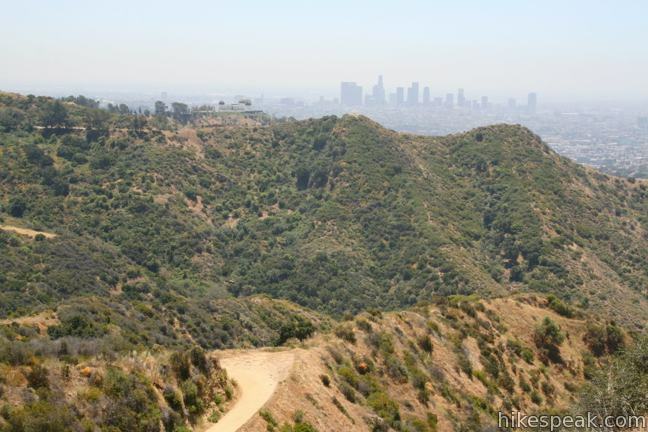 The land was purchased in April or 2010 and donated to the city to become part of Griffith Park. The single-track trail to the less-visited summit is a nice change from the wide fire roads leading up to the Hollywood Sign. 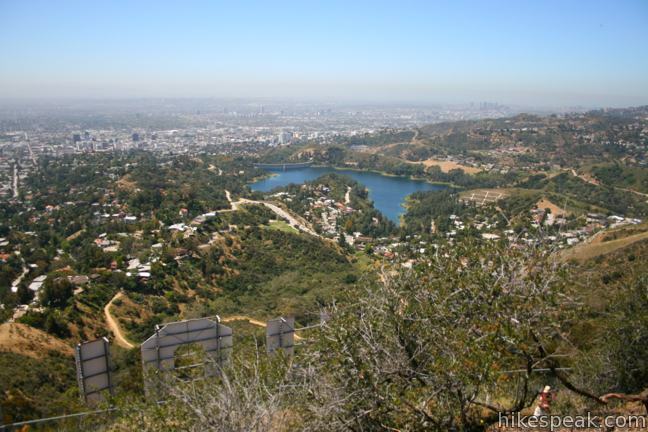 After seeing the Hollywood Sign and enjoying the view from Mount Lee, you may return the way you came for a 3.5-mile hike (or a 4.2-mile hike if you include Cahuenga Peak). 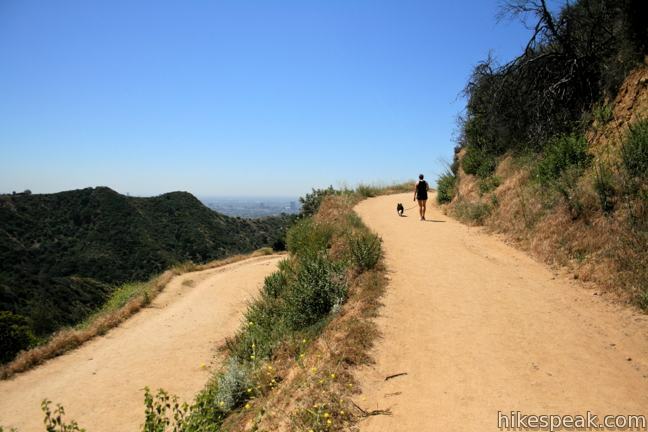 No fee or permit is required to hike in Griffith Park and this trail is dog friendly so get out and enjoy! 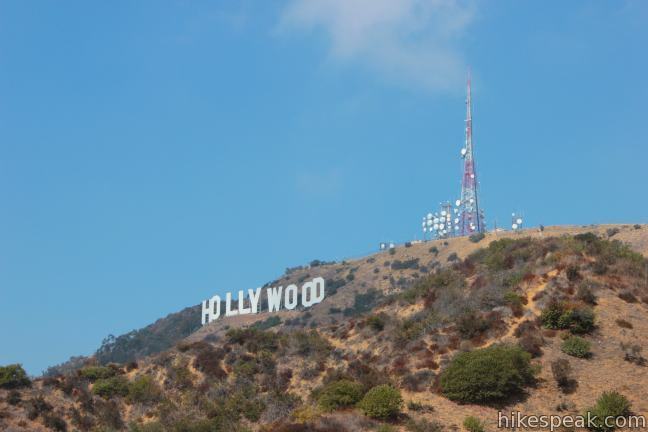 Check out this breakdown of the trails to the Hollywood Sign to compare the routes to Mount Lee and find other hikes in Griffith Park. Update: After a 10-month long construction project from 2014 to 2015, a gate was added on Beachwood Drive below the trailhead (photo below). A door on the left side of the gate can grant pedestrian access to hikers. On the other side, it is a steep walk up the road to the start of the trail on the right. A small parking area next to the trailhead can only be reached if access is granted at the gate. Otherwise, hikers must rely on limited and restricted street parking. Second Update: In April of 2017, Beachwood Drive access to Hollyridge Trail was closed off again. 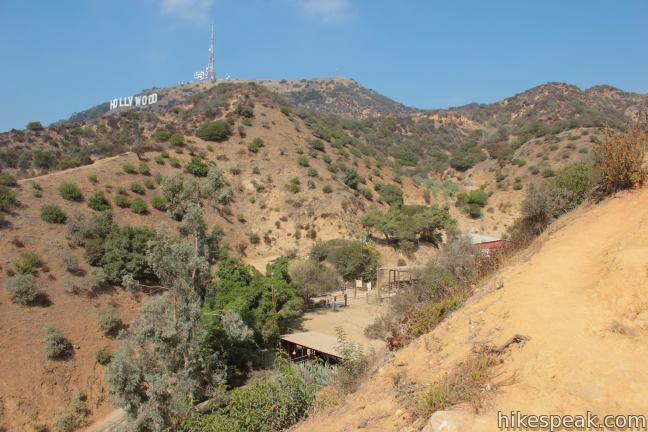 The park is rerouting visitors to take Brush Canyon Trail to the Hollywood Sign for legal (and NIMBY) reasons. Read more at dailynews.com. A judge ruled that pedestrian access and the long-constructed gate interfered with the business operations of Sunset Ranch. The result has been to close the trailhead for hikers. What about a better outcum? A park operated shuttle to the trailhead could provide access with minimal impact to the surrounding neighborhood. 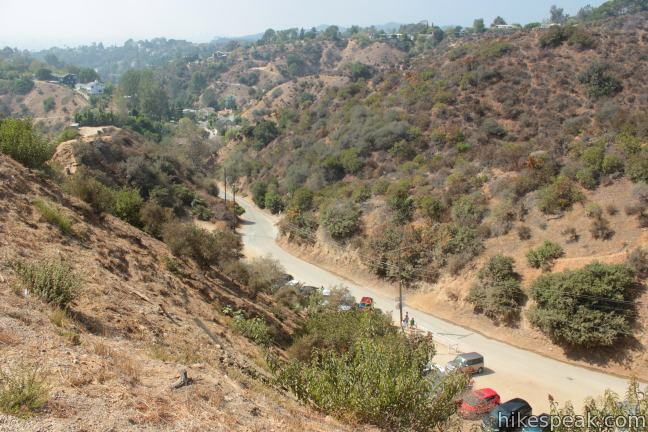 If the city’s DASH bus line could be extended to the top of Beachwood Canyon or a Griffith Park shuttle bus was created, hikers could regain trail access with a system that benefits all sides. 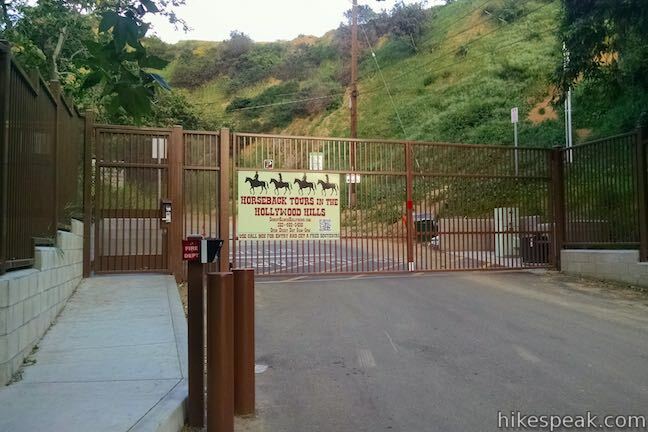 Negotiate with Sunset Ranch to relocate their horse stables about a mile to the southeast to the large, undeveloped part of Western Canyon in Griffith Park. Sunset Ranch could gain more exposure at this location while retaining access to the trails they use now. Develop the current Sunset Ranch area into a proper trailhead, with off-street parking, a bus & shuttle stop, bathrooms, and maybe a food truck or two. To get to the trailhead: Take the 101 Freeway to the Gower Street Exit (8C). From the southbound off ramp, turn left on Gower Street, make the first right on Franklin Avenue, and an immediate left on Beachwood Drive. From the northbound off ramp, turn right at the bottom of the ramp onto Beachwood Drive and cross Franklin Avenue. Proceed north on Beachwood Drive for 2 miles to the gate at the top of Beachwood Drive outside Sunset Ranch. The trailhead is on the right up an ascent beyond this gate. However, because of the gate, the limited parking at the trailhead may be unreachable. 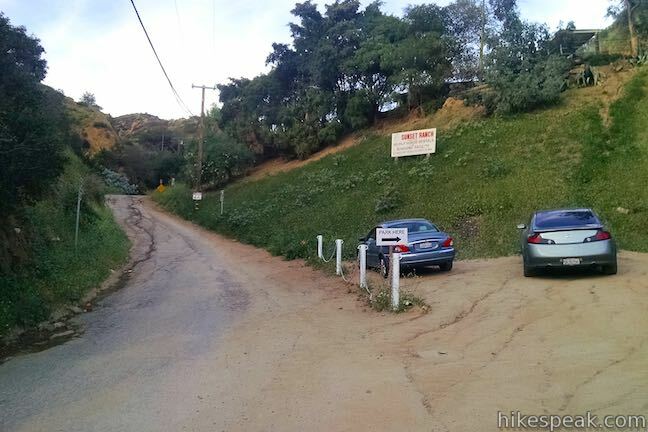 Instead, hikers are forced to park on the street south of the gate. Parking on Beachwood Drive and the surrounding streets in by permit only from 8 a.m. to 6 p.m. on Saturdays, Sundays, and holidays, making it harder to visit the trail on those days. The parking restrictions start at the intersection of Beachwood Drive and Westshire Drive, over half a mile from the trailhead. These photos were taken in May of 2010, August and October of 2012, and March of 2015. Click to enlarge. Due to a long gate construction project, the trailhead for Hollyridge Trail has been closed for most of the spring of 2014 (still closed at the end of June). I’ll add an update when the trail is reopened. And is it only permitted street parking now? What about the dirt parking right at the trail start, are you allowed to park there without a permit? The trail is not open yet. Please note that when it does open street parking will no longer be available for visitors. Street parking will be limited to residents only from 8am to 6pm. This is due to the high volume of cars on the neighborhood’s streets (most winding and narrower than 18 feet). Usually over 1000 cars a day on weekends. If you park and don’t have a permit pass you will be ticked and possibly towed. Thanks for the info! Do you know if the park has considered running a shuttle on weekends? It would be great if there was a way for hikers to get up Beachwood without having to drive through all the people standing in the middle of the street taking selfies and deal with the really challenging parking. If not a shuttle, maybe the Dash bus could go all the way to Sunset Ranch on weekends. It seems like some alternative is needed. I guess the NIMBY won . So this has become a private trail access to the local home owners? 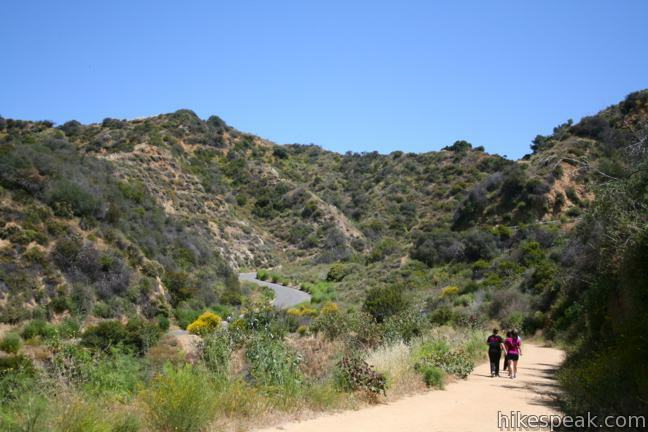 Hikers don’t need to go through Beachwood drive to hike. It was never an official trailhead. 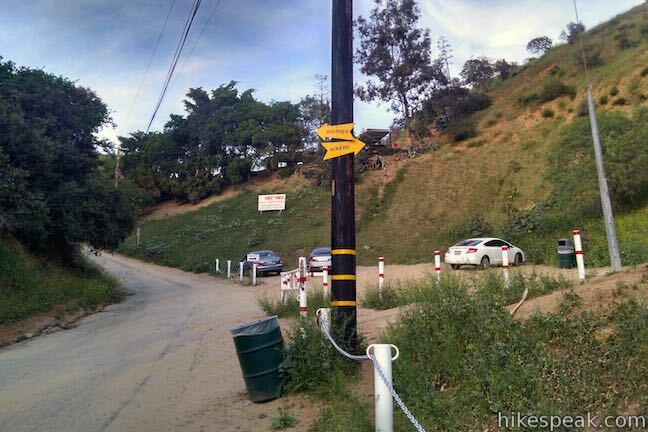 The trail head at Bronson canyon park leads to the very same trail that goes to the sign. And there is plenty of parking past the gate. Fern Dell also has a trail head and bathrooms, parking and a cafe for your espresso or latte. 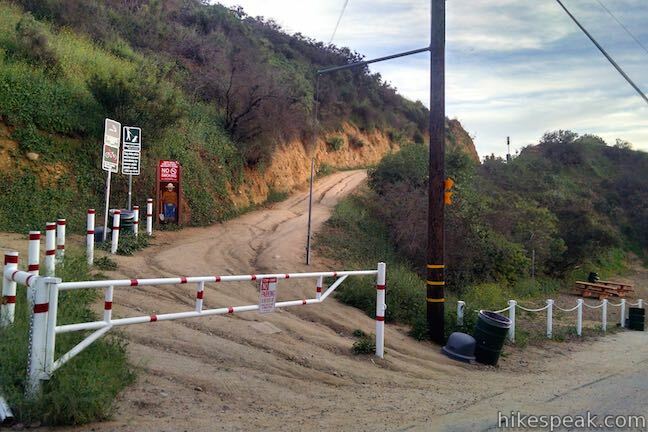 Hollyridge trail is now open as of today (01/05/2015) Parking is no longer allowed in the small parking lot next to Sunset Ranch as the gate has been built before that. You have to park on Beachwood Dr or the surrounding streets only if permitted. Restrictions on Beachwood are Saturday-Sunday & Holidays until 6pm. It’s true. The trail is finally open again! Just wanted to say thank you for the explicit directions and easy navigation! A small group of us went last weekend as a trial run before a larger group comes out next month. It was really delightful, so pretty, and totally enjoyable. Still trying to work out the parking though. Thank you again! Hi all, there are a group of 12 of us hiking up next wknd to the sign. Does anyone know how close you can park near Beachwood? How close or far are the restricted parking areas from the trail head? Wondering if we can still use the Beachwood access but park further down and just add the extra 1/2 mile or mile or whatever it is to our walk? The restricted weekend parking starts around 2900 Beachwood Drive (above the intersection with Westshire Drive), which is 0.6 miles from the trailhead. GREAT and simple directions, easy to follow. What is the address for the Fern Dell trailhead – please and thank you? Love all your information and cool spots on this website – SUBSCRIBED! Hello! You’ve got a great site… I’ll subscribe as soon I finish this note. Is this trail stroller-friendly? It’s a jogging stroller that can handle rough terrain okay, I’m more wondering about the width of the trail. Thanks! Can I hike here after dark or will the gates be closes? 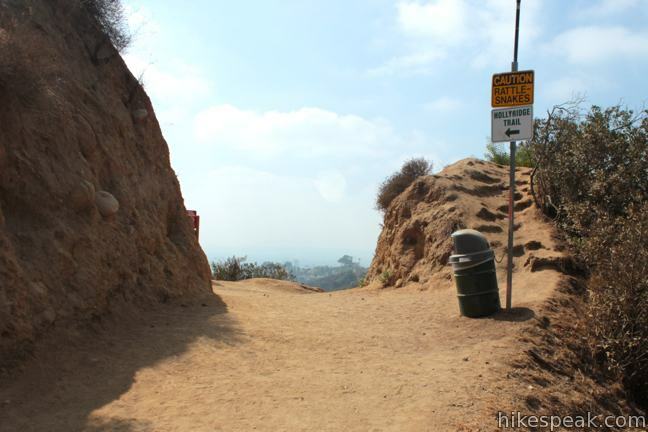 Is it possible to hike and reach the sign to see the sunset view and then hike back down or is this ranger enforced area? Thanks! Maybe I’m just dumb, but I got lost SEVERAL times on this trail. It’s not marked very well and if you don’t make a sharp left turn instead of going straight (which seems like the more natural way to go) you’ll go 2 miles out of your way like I did. What a workout! And ended up carrying my 6 pound lazy dog for 5 miles too. Awesome view though, totally worth it! This trailhead is near impossible to get to on the weekends. There is a locked gate with security guard just prior to the old small lot. There is also no parking unless permitted all day on Saturday and Sunday. Trail access is definitely suboptimal at the moment. Does anyone else think the DASH bus line should be extended to the top of Beachwood to provide a shuttle for hikers? 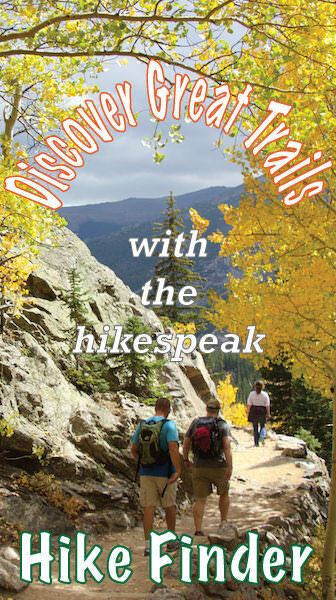 Looking to do this hike during the week. Currently, where should I park and are the directions given on this site still useable? Thanks! does anyone know how long does it take? anyone know how long it takes to hike up Hollyridge trail? 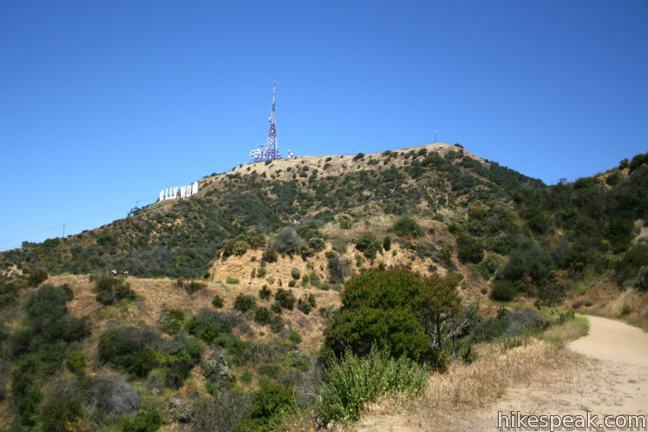 I am confused about the different information about the time it takes to hike up to the Hollywood sign from Beechwood and Bronson/Canyon Dr. I’ve done both and Bronson took about 20 minutes longer roundtrip but it was a better hike. Not as steep and there was tons of parking right at the trailhead. So few people on a Saturday that I at first I wondered if I was in the right place. The Beechwood residents are famous for hating tourists and unfortunately we hikers seem to get lumped in with them. It is pretty crowded so I can sort of understand. Whatever you do, don’t even think of parking on Beechwood on weekends. You will have a ticket before your engine has a chance to cool down.